If I ever have to roll on the floor to amuse myself, please put me out of my misery. One thing that I struggled with in this episode is when I looked at Victorique, I was reminded of another character. 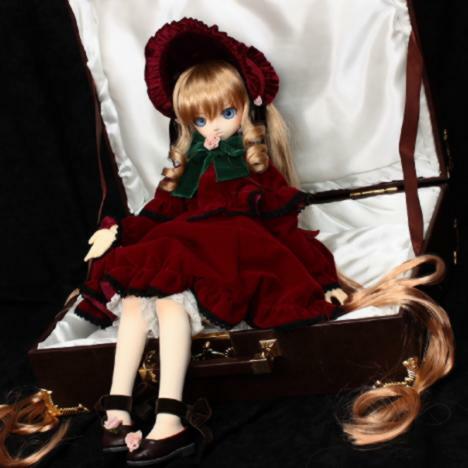 And every time my associated with that character started to fade, someone talked about how she looked like a doll, or was doll-like, or something, and it was a case of ‘Ahhhhhh, I’m seeing Shinku’ all over again, and I had to remind myself she was a different character. Like any of you know who Shinku is. Anyway, I have two very differing lines of thought coming from my first episode. My fist line of thought was that I think this could be a fun and enjoyable series, and I may like it, although I could be wrong. It had enough that pointed in the direction of something interesting could happen, and enough I could poke fun at. My second line of thought is ‘God, that first episode SUCKED’. I’m not really impressed by Victorique. She’s suppose to the equal to Sherlock Holmes, but she got the mystery wrong, and locked up and innocent maid. It was obviously Peta, outraged at the rabbit torture taking place. Thank god that innocent women escaped! The one thing I do have to give this credit for…freaking awesome opening and closing. I really liked them. The animation style in both of them really worked, and I found both really enjoyable to watch–more so then the episode. With nothing else to say, I’d like to share this review I found on MAL, as I can’t link directly to the reviews. Name omitted, because I’m not quite sure if the author wants to be associated with this. Gosick was a literary masterpiece of a light novel. The reason being the little girl’s dfc was so amazing that as I read each of her words, I imagined my own face brushing up against her chest. The little girl, Victorique has some background stuff to her, but it’s not really important, what REALLY matter is how bloody cute she is. When you see her yawn, or roll on the floor in boredom, your heart will flatline and you’ll cry tears of moe moe ~kyun. She’s so adorable the rest of this show doesn’t even matter. Detective stuff? I don’t know if she thinks she’s Conan or Sherlock, but she sure is adorable when she blushes. 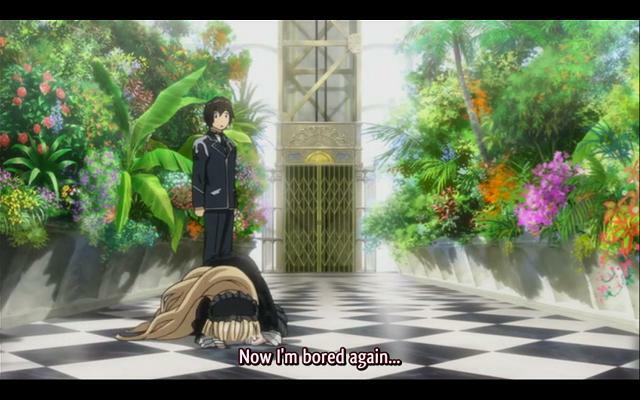 To add on after watching episode two, there other redeeming features I’ve noticed Victorique has now. She has an adorable pouting face, and her sarcastic laugh is just amazingly kawaii desu (tl note: kawaii means cute), and the way she’s so stoic around corpses makes me want to cuddle with her in a graveyard. The guy who accompanies her is some baka beta male who dances for her when she commands (or maybe he’s a guy who likes being bossed around by cute little girls like I am). He’s a baka gaijan in some country with a lame nick name (Dark Reaper/Springtime Reaper, he’s a baka inu so who cares). Anyways, all you need to know is he’s totally her manservant. I think…if it’s a parody, it’s brilliant. If this person is serious, and these are a majority of the people I write for…I going to sit in the corner and cry, hating myself for still liking moe. I’m going to take the small chance that person is serious as an excuse for not retrieving more screenshots post my computer crashing. No more dfc for you. It’s nothing to do with being tired and lazy and still having more first impressions to do. I’m skipping other blogs impressions right now as it’s 12:27 am, I have a 8:00 am tomorrow, and other peeps have been disappointed with the first episode. This post also lacks screenshots. The big question is, does she roll on the ground? I liked the first episode a little, but it wasn’t as great as I was hoping for. The first episode was a bit better in some ways (like mentioned, the mystery) and it also lost me a little in others (I’m already getting sick of how little there seems to be to Kazuya). And in answer to your question above, haha, no she doesn’t roll on the ground. I think the series is going for the sheer moe appeal.